Tory Nyhaug of Coquitlam, BC, successfully defended his time trial title at the 2013 Canadian BMX Championships in St-Albert, Alberta, while Amelia Walsh of Ayr, ON won her first elite title in the women’s race. Nyhaug, who finished a remarkable fifth place at the 2013 UCI BMX World Championships after recovering from injuries, covered the superb track in a stellar time of 30.98 seconds to win his third consecutive Championships time trial race. Since turning elite, Nyhaug has won all five Championships races in which he participated, clearly establishing himself as the rider to beat. “Tomorrow is more or less the same as today. I want to focus on the little things, riding my race with clean laps and hopefully win again tomorrow,” added Nyhaug, who represented Canada at the 2012 Olympic Games. James Palmer finished in second place with a time of 32.41 seconds, while Connor McCormack took the third place at 32.84 seconds. In the women’s race, Amelia Walsh rode away with the time trial title, posting the fastest time of 37.64 seconds, improving from her second place last year. In winning the race, Walsh earned her career first red and white jersey. “[Winning] was definitely my objective coming here, especially after the World Championships which were kind of a bummer, and it’s good to be back on,” continued Walsh, who plans to race the supercross race at Chula Vista later this fall. In second place of the women’s elite race came Chelsea Kingston with a time of 38.24 seconds. Rosemary Adams rounded up the podium with the third fastest time of the day of 38.83 seconds. 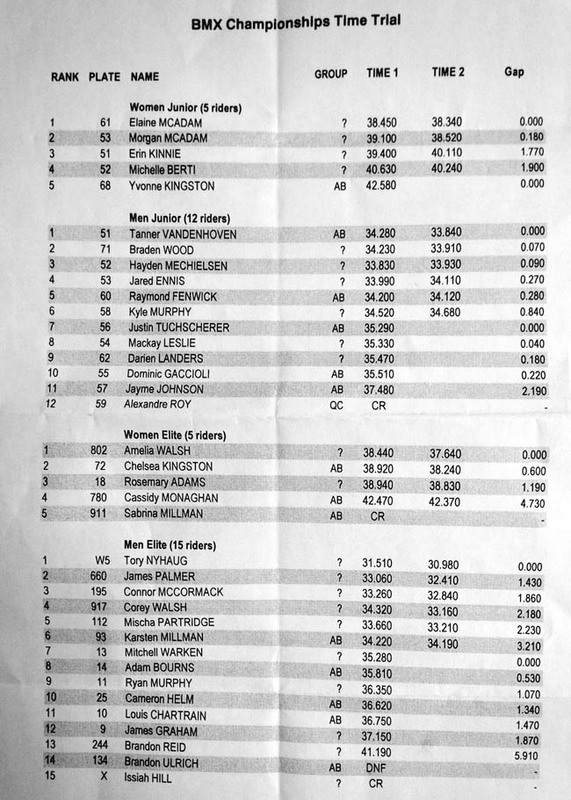 In the junior category, Elaine McAdam won the time trial race in the women’s race at 38.34 seconds, topping her sister Morgan McAdam and Erin Kinnie in second and third place respectively. Tanner Vandenhoven won the men’s race with a time 33.84 seconds, crossing the line just 0.07 second before Braden Wood and 0.09 second Hayden Mechielsen. The competition is held on the newly refurbished track in St-Albert with brand new paved corners, a well-loved track from the group of riders. The competition resumes tomorrow with the BMX motos and main races at the Canadian Championships.